When Rory bent down to inspect the flowerbed, she caught sight of something twinkling in the dirt. She knelt down on the grass and plunged her hand into the cool earth, clearing away the soil from around the sparkling object. An involuntary cry of alarm sprang from her lips. Her tennis shoes slid on the damp grass as Rory leapt to her feet and gaped at the finger sticking out of the dirt. She closed her eyes and said to herself over and over again: It’s not real. It’s all in your mind. Once she’d convinced herself the finger was a vision caused by too many hours at the computer, she opened her eyes and stared down at the ground again. 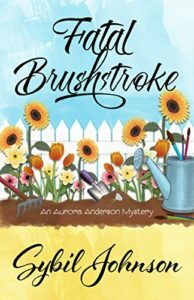 Such fun to chat with Sybil Johnson about her cozy series, the Aurora Anderson mysteries. Her heroine combines the logic of a computer programmer with the ability to see — and notice details — with an artist’s eye. The warmth of her circle of family and friends — not to mention a good-looking detective and a steady supply of mysteries to solve — makes this series a great find for cozy fans. Sybil gives a shout-out to one of my favorite cozy authors, Gigi Pandian, whom I interview here, and also Leigh Perry’s Family Skeleton mysteries. Also, if you — like me — happen to be a sucker for holiday mysteries, let me send you over to Janet Rudolph’s website, Mystery Fanfare, where she routinely publishes lists of mysteries involving holidays both major and obscure. There are three books in the Aurora Anderson Mystery series so far, and three more to come. Book Four, Designed for Haunting, will be out for Halloween, but you can preorder it now. You can find Sybil online at her website (her questions for book groups are here), on Twitter, and on Facebook. And you can find her blogging at the fun group site, Type M for Murder. The group includes Vicki Delany and Frankie Y. Bailey, both of whom I’ve had the pleasure of interviewing. Laura Brennan: Author Sybil Johnson began her love affair with reading in kindergarten, with The Three Little Pigs. She then discovered Encyclopedia Brown, and the die was cast. 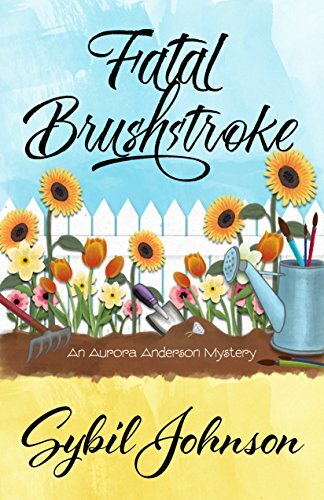 Her Aurora Anderson mysteries are perfect cozies, combining art, friendship, a good-looking cop, and a hefty dose of murder. Sybil, thank you for joining me. Sybil Johnson: Thank you for having me. LB: So, like most of the mystery writers I chat with, you had another career in another field before you started writing novels. SJ: That’s right. I was in software development, I was a computer programmer, I also managed computer programmers, which is a little bit like herding cats. And I did that kind of thing for 20 years. LB: What I found with mystery writers — and I’m sure it’s true of all writers, but I like mysteries, so with mystery writers — writers write themselves and their world into their books. Which is fantastic, I think it’s one of the reasons why every series is unique. So you were in computers and your heroine Rory is a computer programmer. How did you develop her character? SJ: Well, first off, I decided to do that, I decided to make her a freelance one. Anytime you have an amateur sleuth, you always have to have them have time during the day to go out and detect. And if she’s a freelance computer programmer, she can work whenever she wants. She can work at 2 AM if she wants, and she can do her stuff during the day. So that was one of the reasons. And also, I thought it would be nice character because she’s very analytical, which most computer programmers are, which I am. But she also has an artsy side, which is where the Tole painting comes in. LB: I was interested in that. It seems like an interesting juxtaposition, the logic brain of programming and the artistic expression of painting. You are a Tole painter. SJ: Right. I’ve been doing that since the early 90s. LB: So what exactly is Tole painting? SJ: Well, it’s more commonly called decorative painting today. When I started in the 1990s, it was called Tole painting. It’s really just painting designs on anything to decorate it. A large part of it is on wood pieces, and it has its roots in folk art like Rosemaling, which comes from Norway and a lot of other places around the world. It has more modern aspects, and you learn certain strokes, and you learn how to highlight, and all kinds of things. And then you apply them to patterns. What I particularly like about it is, while I enjoy painting, I don’t know that I could come up with designs myself. So what you do is you purchase designs and instructions from other people who are into that kind of thing, and you can create some really wonderful things. I particularly like doing Christmas decorations and Halloween decorations. LB: That’s so interesting, because it is actually a little like programming in that the people who create the design create something that other people then can make art out of. SJ: Yes, I hadn’t thought about it that way before but, yes, it is, isn’t it? LB: So did you always want to write fiction? SJ: No. I obviously wrote creative writing assignments when I was a kid. I didn’t actually decide to write until I was in my early forties, when I was at the end of a programming contract. I woke up one morning with this image of a woman finding the body of her painting teacher in her garden, and I thought, well, that could be fun to write. So I decided to try writing it. LB: Well, I love that. That is how your first novel, Fatal Brushstroke, opens. It opens with one of those moments where reality just shifts. Your heroine is just going about her day and suddenly she realizes someone has been in her backyard. LB: Not to make too much of a pun here, but it is actually very artful, and I mean that in the sense of, it’s such a visual opening to the book. How did you decide to make art the real backdrop of it? SJ: Well, computer programming is not exactly the most exciting thing in the world to talk about. I enjoy doing it for a long period of time, and when I’m in it, I really do enjoy creating programs. And I consider how you create programs to be bit of an art, because there are so many ways to do things and you can create really beautiful programs that are just elegant. But that’s all — from the outside looking in, that’s very boring. So I decided well, decorative painting or Tole painting doesn’t have any other, there’s no one doing that kind of thing in the mystery world. There are mysteries about quilters and there are mystery about scrapbookers and all these other kinds of things, but there was nobody doing the Tole painting thing. So I decided that was an important thing to do. 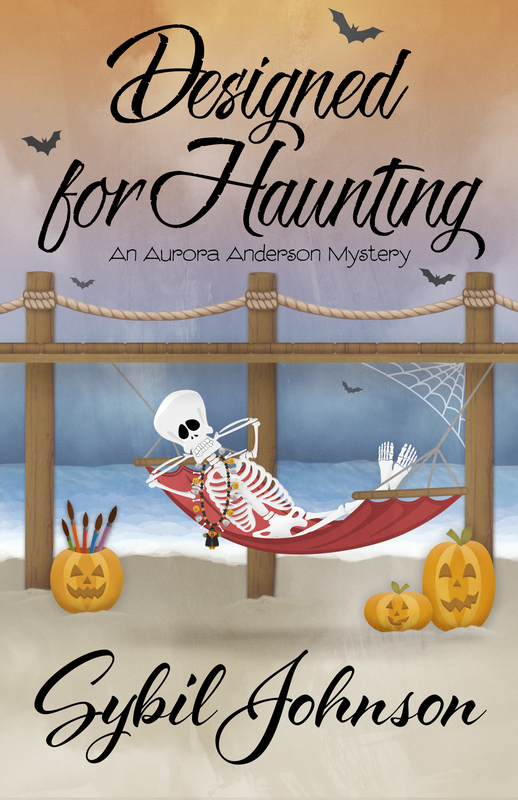 LB: So when you started writing, did you develop your Aurora Anderson mysteries is a series from the get-go, or did you think, no, I’m just going to write one book and then it turned into a series as you were writing? SJ: In the back of my mind, I thought this would make a good series. So I guess I always thought about it is a series from the beginning, but there’s always, when you start writing and you have no idea what you’re doing — it took me 10 or 15 years to finish writing that book and get it published. You never know whether or not that’s actually going to happen, but it was in the back of my mind. 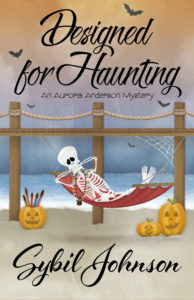 LB: One of the things I really like about the Aurora Anderson mysteries is that they perfectly hit the form. How did you come up with all these ingredients and start mixing them? SJ: Well, I have been reading cozies ever since I can really remember — ever since Agatha Christie, I found her in junior high. So I think I have a feel for that, but also when I started writing one of the things I did was I picked up a couple of books that I really liked that were in that cozy bent and I analyzed them because, you know, I’m a computer scientist kind person and I analyze things. It helped me understand how things work, but I think a lot of it is just the many, many, many years I’ve been reading that particular kind of book. LB: Who do you read? SJ: Oh, lots and lots of things! I love Gigi Pandian’s Accidental Alchemist series, and I like Leigh Perry’s Skeleton in the Family series. I pretty much read anything and everything, and I like the older stuff: Agatha Christie, I still read, and I like the Miss Silver mysteries that Patricia Wentworth did. And I do, occasionally, go over into the darker side of things, the private eye kind of stuff, but cozies are pretty much my main reading material. LB: So Fatal Brushstroke, this is not giving anything away, Rory finds a body and finds herself a suspect. LB: That is how you launched the series, but she keeps finding bodies. And you address that head-on. You know, the Cabot Cove syndrome from Murder She Wrote. After she discovers her third body in five months, people start looking at Rory funny. SJ: [Laughter] Well, wouldn’t you? But, yes, you have to put that in there, and you also have to have reasons for her to investigate, which I think is one of the hardest things to do in amateur sleuth. LB: Was there any thought about not having her be an amateur sleuth? Did you ever toy with the idea of having her be an actual professional? SJ: No, I’ve never toyed with that because I don’t know enough, even though I’ve certainly read a lot of things on forensics and I’ve attended classes here and there, I don’t think I know enough to write that kind of book successfully. And amateur sleuths are really the things that I enjoy reading, and one of the reasons is that you have someone who’s just the usual person and their thrust into this world that they’re not used to. They need to figure out how to work around that find out what’s going on, either to protect a loved one or themselves or something like that. LB: When you sold it, did you sell it as a three book series, how did you sell it? SJ: Yes. When I sold Fatal Brushstroke, it was a three-book contract. LB: So your third book was then A Palette For Murder. LB: That’s a little different. That one has — all three of them have heart. I thought that A Palette For Murder was a more complex mystery, let me put it that way. Did you feel that? SJ: Well, I feel like all of them are little bit different because as you write, you grow as a writer and you figure out what works and what doesn’t. I don’t know that I thought of it is more complex. I think they’re all pretty much the same. I always have three different things going on and they weave all through the book and then come together at the end. But I actually do feel it’s a little bit different than the other two, and I don’t know that I know why. LB: You have another book, too, that you’re now working on, book 4. So your series has been extended? SJ: Yes, I have three more books. So Designed for Haunting is coming out October 9, so I just sent in the ARC proof changes to that. Now I’m starting to work on book 5, which is a Christmas themed one, which is Ghosts of Painting Past. And the one after that will be a Valentine’s themed one. So as you can tell, Designed for Haunting is a Halloween one, which was loads of fun to do. LB: Oh, that’s great. One of the things I love is how well cozies play with the holidays. I’m just a sucker for holiday mysteries. SJ: Yes, so am I. Particularly the Christmas ones, but I do love the Halloween ones as well. LB: Now, you also write short stories. SJ: I have written some, though I haven’t written any in quite a while. I wrote half a dozen or so, and they were all published in various online venues. They tend to go — well, some of them are sort of cozy-ish, amateur sleuth, that kind of thing. But a few of them go on the darker side. I like to think of them is my revenge fantasies. Anytime I want to get revenge on someone because they annoy me, that’s when I write a short story. LB: That is so true! Do not annoy a mystery writer! LB: You will be killed. It will be awesome. So you also, you have many interests, and one of them is that you study ancient languages. LB: I want to know when were going to get the ancient Egyptian murder mystery. SJ: There are a number of people who have done that, and I don’t know that I can do it as well as that. I haven’t really come up with an idea yet, but who knows? Maybe. Maybe one of these days I will. LB: You also — because you just don’t have enough writing to do — you also blog every other week with several other mystery writers on Type M for Murder. SJ: Right, right. Which is loads of fun because were quite a diverse group, we’re from all over the place. Somebody’s in Scotland, a number of people are in Canada, some of the people are in the US. And we’re all at various different stages of our careers and write different kinds of things. It’s really quite interesting to see what everyone talks about. And we all sort of play off each other; somebody says something one time and then you bring in your opinion and it’s quite fun. But, yes, luckily it’s only twice a month because with everything else is going on it’s hard to do anything more than that. LB: I like it because it is, exactly as you say, you guys riff off each other’s ideas. It’s almost as if I’m part of a conversation that’s happening between all these different writers that I love. LB: So Rory has gone through a lot, personally and with her family, friends, in these first three books. What can we expect for poor Rory in book 4? SJ: Well, Rory receives, in the beginning of book 4, she receives an email from a friend of hers through a company called Beyond the Grave. And these are actually real companies — Beyond the Grave obviously is a fake one — but there are real companies out there that if you die, it will send emails to people. Typically it’s used to send somebody the passwords for their accounts or instructions on what to do about certain kinds of things. What happens is, you’re sent a tickler every day and if you don’t respond to three of those in a row, they assume that you’re dead or missing or something like that and they automatically send it out. So that’s what happens with her friend. Rory receives this email, and the beginning of it basically says, “If you’re reading this, I’m either missing or dead and you’re the only one I can trust so please find out what happened to me. And I think I have a stalker.” Poor Rory now has to deal with that. LB: Okay, wait, we need to go back a second. I’m fascinated with this. There are actually companies that do that? SJ: Yes. One of them used to be called DeadSwitch.com, I don’t think that one’s around anymore. But there are still some around. They sort of come and go. I found out about this many, many, many years ago when there was an article in newspaper and so I clipped it out and I thought oh, I have to use that in a story someday. I thought this was the perfect place to do that. LB: Absolutely. And remind me again what the name of this book is? LB: What a perfect idea for Halloween story. SJ: Yes, and I really had a lot of fun with the Halloween. One of the things I put in is, in the city that I live in, we have a pumpkin race every year. People decorate pumpkins and they put wheels on them and they roll them down the hill. And so I ended up putting that in the book, and a few other things that happen around the beach cities at Halloween time. So that was fun to do. LB: I wanted to ask about how you developed some of the other characters. Her life is so full, she has friends and she has family and she has sort of a possible relationship with a certain handsome detective… How did you develop the world? SJ: That’s an interesting question. Well, for her best friend, Liz, I made her the opposite of Rory. Rory is a lot like me, although I think she’s braver than I am, and she’s taller because I was wanted to be 6 feet tall and I’m not. So her friend is shorter, and her friend has tons and tons of energy. So her friend is actually a lot, embodies a lot of the things that I would like to be. Like having tons of energy and being able to talk to anybody about anything, and just being very athletic, and all those things that I’m not. So that’s how I developed her, and also she’s a lot shorter. So I wanted them to be almost complete opposites yet they have this love of painting that they share. And they really enjoy each other. And then her parents, her father’s name is Swan which is one of my great-grandfathers’ names, or maybe my grandfather, now, I can’t remember. Great-grandfather, he came from Sweden. I decided to make them Scandinavian and have a Scandinavian background, her adoptive parents. Arika is just sort of, I think, a nice — I like the relationship between her and Rory, it’s a motherly yet friendly. Because they’re older now, they have a friendship. So I just felt like she should have parents and she should have a best friend, and then she should have friends that she paints with. LB: She is really interesting, too, because she is a little out of the norm for a cozy heroine in that a lot of cozy heroines are people have gone off and left and has some traumatic event in the big city and then kind of come back to their little family world in order to lick their wounds and heal. I just found Rory to be so very sane. LB: It’s refreshing that she’s very loved, and if these dead bodies didn’t keep turning up, she’d have a very normal, sane life. SJ: Right, exactly. I wanted her to be fairly normal. She does have the background of her birth parents to deal with, but that’s pretty much taken care of in the first three books. It’s always sort of back there but really, she does, she’s a very normal person and that’s what I wanted her to be. I wanted her to be normal. LB: So you also developed a hunky detective. Martin Greene is, he’s not merely there is a possible love interest. He’s a very different character from Rory. LB: And he also has his own back story that plays out over the books. How did you come up with him? SJ: I wanted a detective that actually was good at his job. But also I wanted somebody who was an outsider coming into the city. He knew people in the city, but hadn’t lived there or worked there before. He’s almost like escaping into this — like you talked about, the other amateur sleuths often are like escaping back home — he was almost escaping into this quieter area because of things that had happened in his past. And I figured somebody who was a good detective would do an awful lot of listening, which is what he does. He does a lot of listening. But he’s also very calm individual. I actually had watched a lot of those 48 Hours or The First 48, a lot of those things where they portray real detectives. And I always thought it was interesting that so many of them, when they question people, they’re very calm, and they’re very friendly. They’re not like it’s often portrayed on television where they’re in your face going after you. So I wanted him to be that kind of detective. LB: How do you come up with the actual ideas for the murders? SJ: Well, the first one obviously came to me in the dream, where she was found in the garden. I didn’t know exactly how the woman died at that point, but. And a lot of it is, I come up with the motive for the murder — why would somebody decide to kill this person — and from that I usually get the method. But I also look at the methods from the previous books and I don’t really want to do a lot of using the same kind of way to kill somebody. And it usually just comes from some sort of an inkling, like this thing with the DeadSwitch.com kind of place where she gets this message, and she thinks she has a stalker, and develop from that. But also, I try to use stuff from the area that I live in. And in the fourth book, Designed for Haunting, the woman who’s a friend of hers is a former child actress. What’s happening around here is that a lot of producers and actors and a lot of the Hollywood folks are moving into the beach cities, we also get a lot of athletes and stuff like that. So wanted to portray that as you see people moving into the area that are very common. LB: So you see people who are outsiders suddenly moving into the area? SJ: Yes, to a certain extent although she, the friend, has been there for quite a while. But, yes, and also this is where you get, you don’t have as much of a Cabot Cove Syndrome because Vista Beach, which is my fictional town, is a Los Angeles County beach city. Because it’s part of a humongous county, you can get outsiders coming in and it doesn’t seem quite so odd that things would happen. Even though it is still odd, because it is a beach city, and we have very little crime other than stealing things out of cars and that kind of thing. LB: Oh, absolutely. Keep the crime on the page, that’s my motto. LB: Where can people find you online if they want to keep up with you and with Rory? SJ: There’s my website, www.authorsybiljohnson.com. And you can find me on Facebook — that has all of the links to my Twitter account, which is @SybilJohnson19, and my Facebook account, Sybil Johnson Author. LB: Of course I’ll link to this in the show notes, I just wanted to make sure people can find you in case they are listening and not going to the show notes. Also, I wanted to mention that on your website you actually have a section for book clubs. SJ: Yes, I just put that one up. My publisher wanted me to do book club questions my first book, and so I did that and they have something on their webpage. And I decided, well, I should do book club questions for all of my books. So the first three are there, and they are suggested discussion questions. They don’t give anything away. Pretty much anything that they talk about is something that you can find out just by reading about the book on Amazon or something. So you don’t have to worry about finding out something that you don’t want to find out. But I think they’re good starting points for that. LB: Sybil, thank you so much for joining me today. SJ: Well, thank you for having me.